This is a book of impromptu effects. 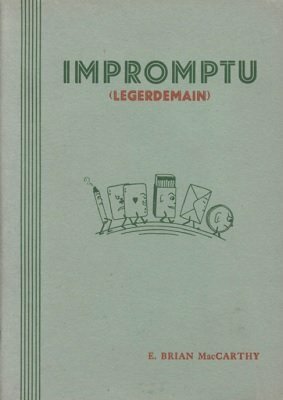 The word "impromptu" has been taken to mean that no apparatus nor fakes need be carried; the performer relies on obtaining one or two objects which either he will probably be carrying on his person, such as coins; or will most certainly be instantly available wherever he may be; such as cards. Simple preparation, as for instance tearing a slit in a borrowed envelope, is allowable, but no more. It is obvious that the word "impromptu" cannot mean "requiring no practice". Any effect, however simple, requires that. But as long as the reader will keep a few effects well-rehearsed he will never be bowled out when asked to "do a few tricks," as after a moment's borrowing and maybe a couple of minutes' preparation he will be ready to perform. The effects described herein are original. I have never seen them performed, nor have I read of similar effects in print. 1st edition 1939, 87 pages; 1st digital edition 2016, 46 pages.